With a kid, a preteen, and a teen in a multitude of activities there are only so many hours and minutes and seconds in a day. My husband and I are only two people. We have only two cars. Only two drivers for now. As you can imagine, weeknights and weekends are a complex web of who will drive which kid to what activity. Throw in the days when we need to get three kids to three locations in the same time frame. Add in the activity where a parent needs to stay. Consider the activity where I need to pick up a kid who isn’t my own kid and drive them somewhere. Factor in the last minute changes in plans frantically texted to me by a kid who just learned of the change in plans. Are you exhausted? I know I am…every single day. My life was so much easier in the days when I would put the baby and the toddler in the minivan and drive to the library for storytime. By the time we got back from storytime, all three of us were exhausted and ready for a nap. Some weeks the storytime was our only activity. I look back fondly on those nonstressful days where I had little to no reason to leave the house with my children. The Heck’s are a family just like mine and yours. The Heck’s son Axl is in football, while Sue is in cross country. Mom and dad wonder how they will decide who goes to which activity. I’ll bet Axl only wants Dad to see his games. But, what about Sue…I am sure she wants Dad to be at her games too. The Heck’s are the family in the show The Middle…and the Heck’s aren’t a million miles away from my family. It would be so much easier to send kids to school each day and have each family member stay home each evening and weekend. But, as you know this is not possible when your kids want to do activities that interest them. 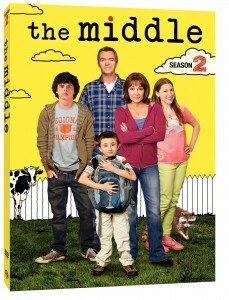 The second season of The Middle is out on DVD. You can purchase it using my amazon affiliate link. Or buy it from major retailers or purchase it online. I have been hired by Warner Bros. WBWord division to promote The Middle Season Two on DVD. The views expressed in this post are my own. I follow the tenets of Blog With Integrity.